Below short list presents my favourite, best of the best places in Sexten Dolomites in Italy. This whole mountain range is breathtakingly beautiful and I'll, hopefully, keep returning. I simply got hooked! These 3 places are capstone of Sexten Dolomites, absolute Italian must-go. Added bonus is that you don't need to be experienced hiker to visit them. You can get there either by car or chair lift. These locations are available for families with children, disabled and any person who, for some reasons, can't or don't want to hike there. This one's an icon of Dolomites. You've either been there or are planning to go there. Tre Cime is easily accessible - you can get to Rifugio Auronzo (2320 metres) by bus, car or on foot. Check the location of this mountain hut here. Car entrance fee to Parco naturale Tre Cime costs 25 EUR, so taking a bus makes the most sense. Bus from Misurina costs only 4 EUR per adult. To get to Rifugio Auronzo we used Dolomiti Bus - cheap and efficient type of transport. You can check the timetable here - you need to choose linee stagionali . Bus stop is next to campsite Alla Baita in Misurina. There are many hiking trails in Tre Cime di Lavaredo natural park. The hiking attractions range from easy family-friendly trails to exciting via ferratas. We chose trail 101 leading from Rifugio Auronzo. Nice gravel road led us to Rifugio Lavaredo (2344 metres). You can check its location on a map here. We didn't stay there long - it was crowded and noisy, so we quickly hiked to Rifugio Antonio Locatelli on 2450 metres (location here). This Rifugio is perfect to stay over for a longer break - there's vast plateau nearby which is great view point for Sexten Dolomites admirers. Like majority of other hikers, we returned to Rifugio Auronzo following trail 105. 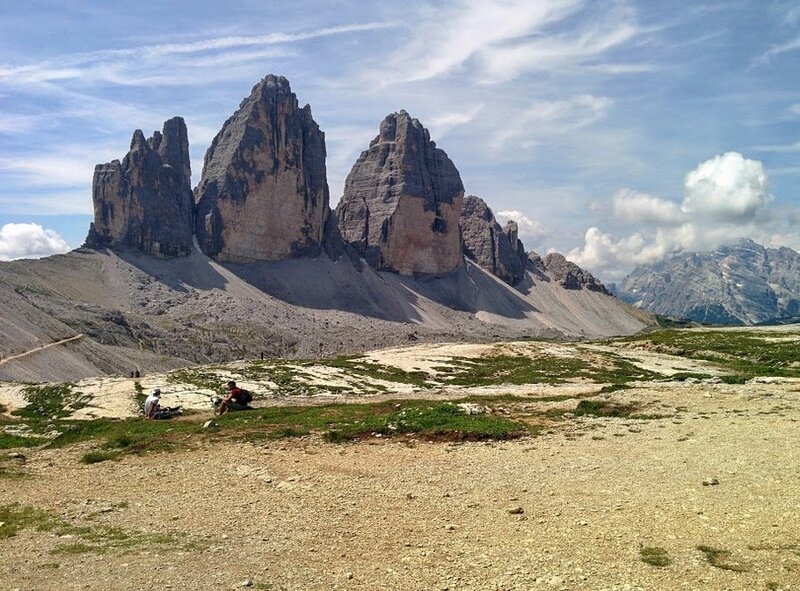 Such option is a great hiking trip - you get to circle Tre Cime mounts and admire epic views. Besides, it's not very demanding and is perfect warm-up or recovery hike - whole circle takes about 4-5 hours. Cristallo mount is located close to Cortina d'Ampezzo (province of Belluno in Veneto region). It's actually a ridge of 4 peaks, the highest of them - Monte Cristallo - reaching 3221 metres. You can check it on a map here. Yes, it's the one where “Cliffhanger” film starring Sylvester Stallone was made. Cristallo is easily accessible by chair lifts. The first one starts from Cortina d'Ampezzo, near Passo Tre Croci (location here). It quickly gets you to Rifugio Son Forca (2215 metres). Then, you need to take the cable car leading to Forcella de Staunies, located next to Rifugio Lorenzi on whopping 2918 metres. This lift is the strangest one I've ever seen - looks like a line of small colourful torches. And the best thing is that to get inside you actually need to run! To get inside the little cabin you need to run fast. In general, I felt a bit uncomfortable there - the cable car is small and old. It's also very slow but I consider this an advantage - you've got time to admire unforgettable views. All is great but beware - such mountain lifts are rather expensive in Italy - return trip for an adult costs 23 EUR. Most importantly, Cristallo is a true paradise for via ferrata hikers and climbers. There's Marino Bianchi trail for more experienced hikers but if you're a beginner klettersteig aficionado, check Ivano Dibona trail. Misurina is one of the most beautiful lakes in Italian Dolomites. Surrounded by just a few hotels and restaurants, it's a nice and quiet getaway. Actually, the location of this lake is its greatest advantage - the village lies on 1750 metres, but it's easily accessible by car! Check it out here. It's perfect place for all kinds of outdoor enthusiasts, adventure seekers and mountains admirers. Misurina is fantastic starting point of many hiking trails, including via ferratas. It's also great place to simply wind up, relax on the shores of murmuring lake, get some sharp mountain air and get away from city's hustle and bustle. We stayed in Hotel Sorapiss. I liked the location of the hotel - it overlooks the Misurina lake. Room was nice and clean, host was very friendly and breakfasts were tasty. I can recommend it as a good getaway close to hiking trails. There are many other fantastic locations in Italian Dolomites but these 3 are my favourites. You don't need to be the world's biggest nature lover or climber to get to see stunning mountain views. True - Tre Cime di Lavaredo, Cristallo and Misurina are very popular and tend to be crowded in high season. But it's really a small nuisance comparing with the views you get to admire there. So, don't think twice when travelling in Italy - go to Sexten Dolomites. They are one of the most stunning places in Europe! What are your favourite locations in Italy?